The County of Riverside, California, has made land records investigation much less complicated and far more sustainable by replacing less efficient methods with a GIS-centric approach that uses ArcGIS Online. The County Surveyor’s office maintains Riverside’s land records. These records include—but are not limited to—corner records [records documenting the placement of survey monuments], survey records, final parcel and tract maps, field notes, benchmarks, horizontal control, right-of-way records (such as vacations, street name changes, dedications), unrecorded maps (such as plans and right-of-way maps), and certificates of correction. These records have been made available to the public via microfilm, Mylar, and paper. Survey staff wrote the physical records by hand and filed records in large-scale counter books or hanging files. While these records are still available, they have not been updated in more than a decade. The County Surveyor developed a tool called Map Inquiry for searching these records that returned a list of values based on how the original data was entered into the system. Typically, that data was entered by map number, project number, or street name or used the Public Land Survey System (PLSS) and was identified by township, range, and section. An individual section will touch a minimum of four other sections that will be included in the results and require examination of each returned document. 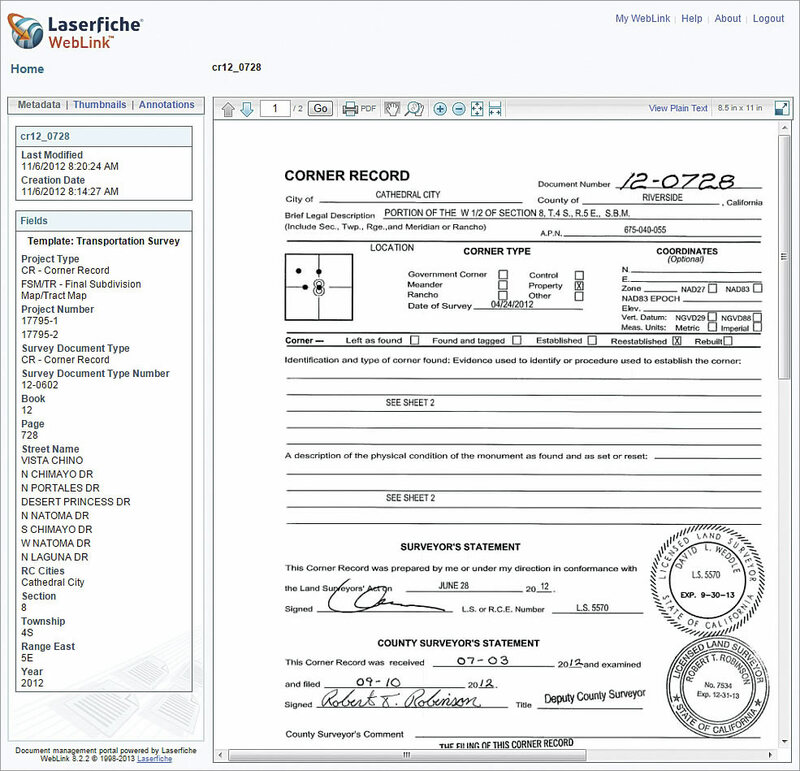 The pop-up for a corner record provides a link directly to the Laserfiche record. In 2009, that system was retired and replaced by an online scanned repository system called Laserfiche. Laserfiche allows for querying the above-mentioned information using a variety of search terms such as street intersection; project number; map number; or section, township, and range. Although a much more user-friendly system that retrieves all the information related to search criteria entered and allows review of the documents, it’s still a record-by-record search and, thus, inefficient. Riverside County has a long history as an Esri software user, starting with ARC/INFO in the 1980s and transitioning to ArcGIS in 2000. The county stores point, line, polygon, and raster data in a versioned geodatabase using ArcGIS for Server. In addition to centralizing all the records, ArcGIS for Server allows multiple users to simultaneously edit layers in the geodatabase. The county began publishing web maps and apps using ArcGIS Online, which allowed the county to launch services quickly and keep information updated. 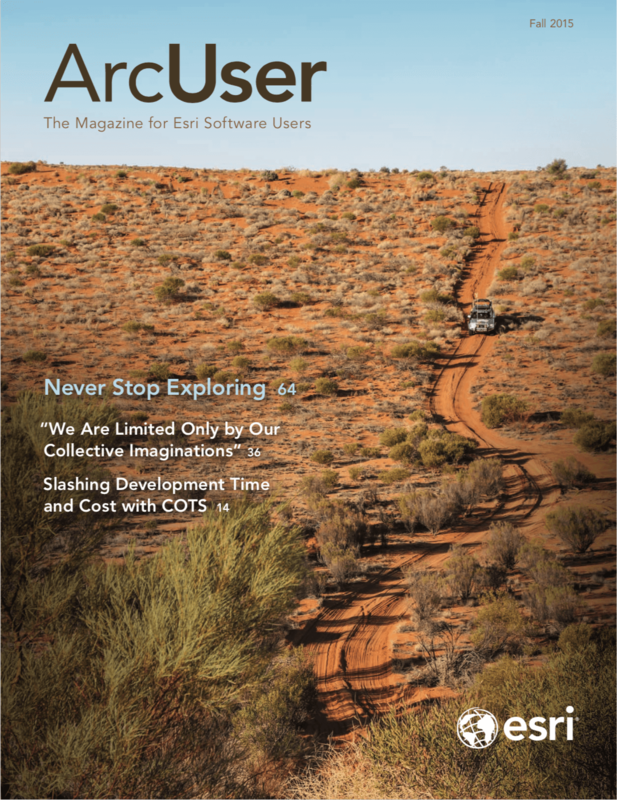 The County Surveyor’s office created an in-house research interface that combines Laserfiche, ArcGIS for Server, and ArcGIS for Desktop into a single map. This map is used by survey staff and the Transportation Department and is shared at the county’s public research counter. The county has an ArcGIS Online organizational account so it can publish maps and apps with hosted feature and tile layers. 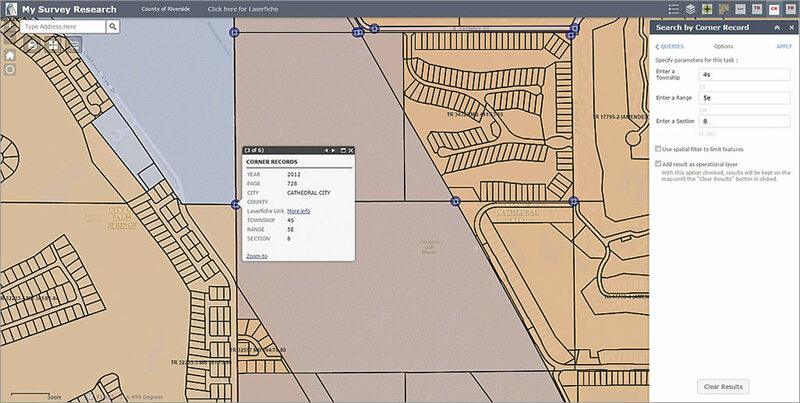 Both feature and tile layers can be used by ArcGIS Online or non-ArcGIS Online applications. ArcGIS Online has made resources, previously only accessible on a limited basis internally, available to the public through ArcGIS Online apps. A search by corner record zooms to the location specified by township, range, and section. The County of Riverside’s ArcGIS Online subscription included Web AppBuilder for ArcGIS, which let the county quickly build custom web maps with widgets and custom styles, then share and publish apps to internal groups and the public. Items in web maps can be linked to a website. The county created My Survey Research, an app for searching land records. It also includes a custom search widget for locating land records by assessor parcel number, intersection, field book, tie book, and corner records. For example, the corner record search locates records within a section, township, and range that fit the entered search criteria. Clicking a corner record invokes a pop-up window that displays more information and a link. Clicking the link takes the user to the actual scanned corner record in the Laserfiche system. Now anyone can conduct research from the office, field, or favorite coffee shop. The new system simplifies the land records investigation process maintained by the County Surveyor’s office and will enable efficient research for years to come.